As one of the best uses of Qantas Points, you’ll get at least three hours of being treated like royalty with access to excellent lounges, a private suite, onboard shower and bar, and a lie-flat seat for only 54,000 Qantas Points plus less than $135 AUD in taxes. 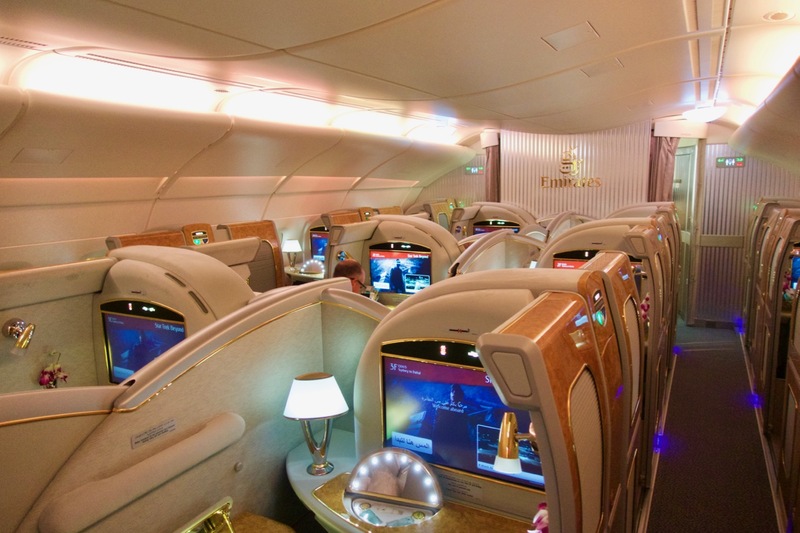 Out of the six airlines that service the Trans-Tasman market, Emirates is the only carrier that flies a First Class cabin between Australia and New Zealand. 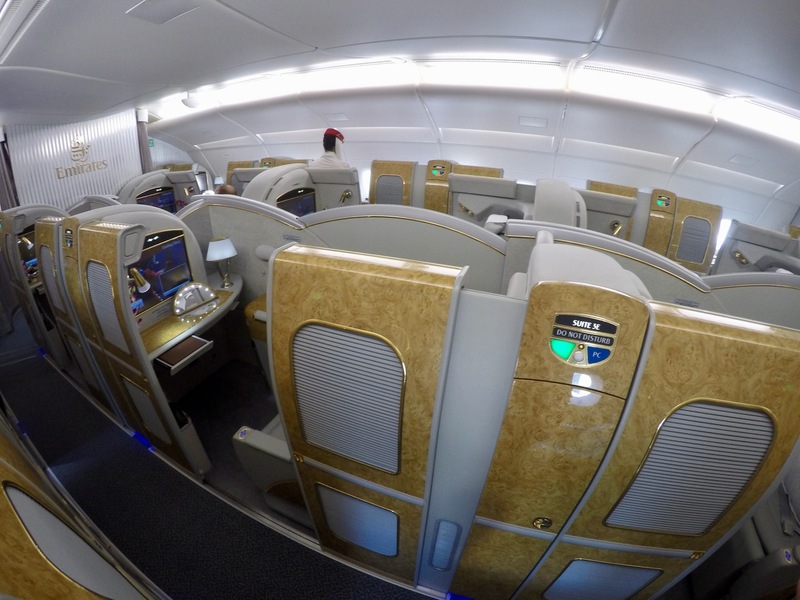 In this guide, we cover the type of aircraft and product you’ll experience on the four routes Emirates services, our recommendations for getting the best seats, a review of the service you can expect from the cabin crew, how to redeem your Qantas Points for this flight, and our tips on which lounges to spend your time in prior to your departing flight. 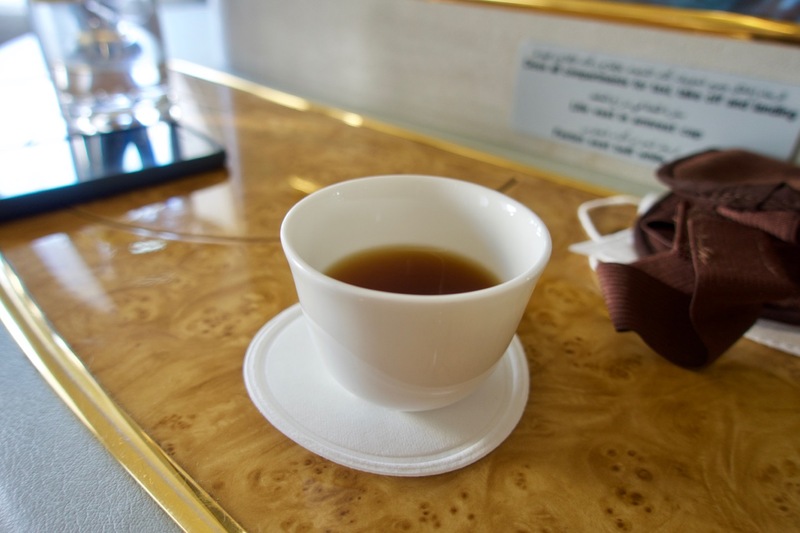 Be sure to also check out our guide to Emirates A380 Business Class across the Tasman. 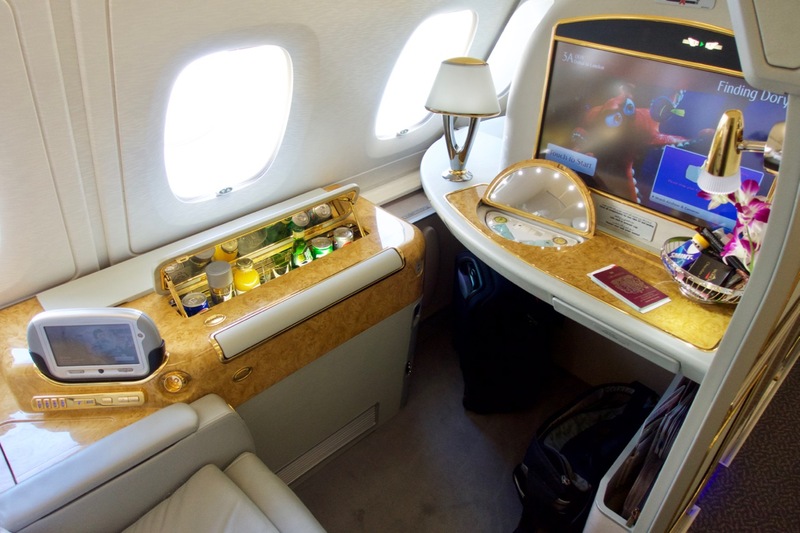 There are two types of planes that Emirates flies in and out of Australia: the Airbus A380 and the Boeing 777-300ER. 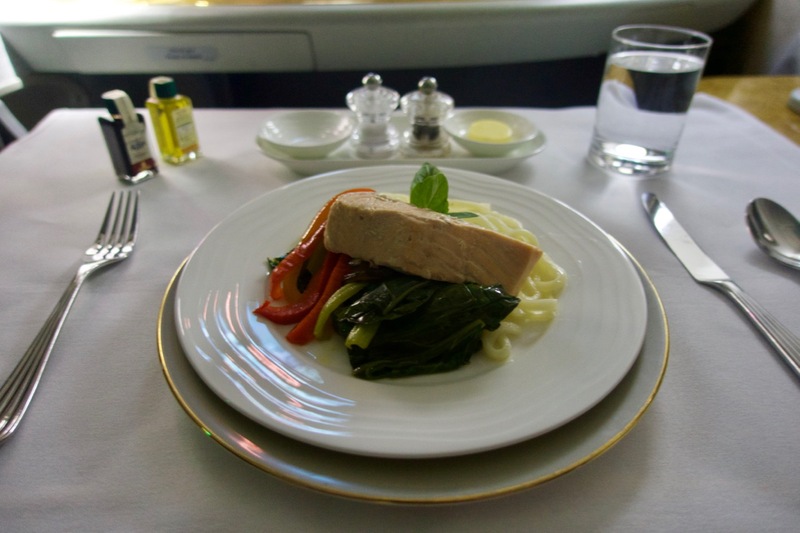 Both feature First Class, with the former hosting 14 First Class Suites and the latter just over half of that at 8 Suites. 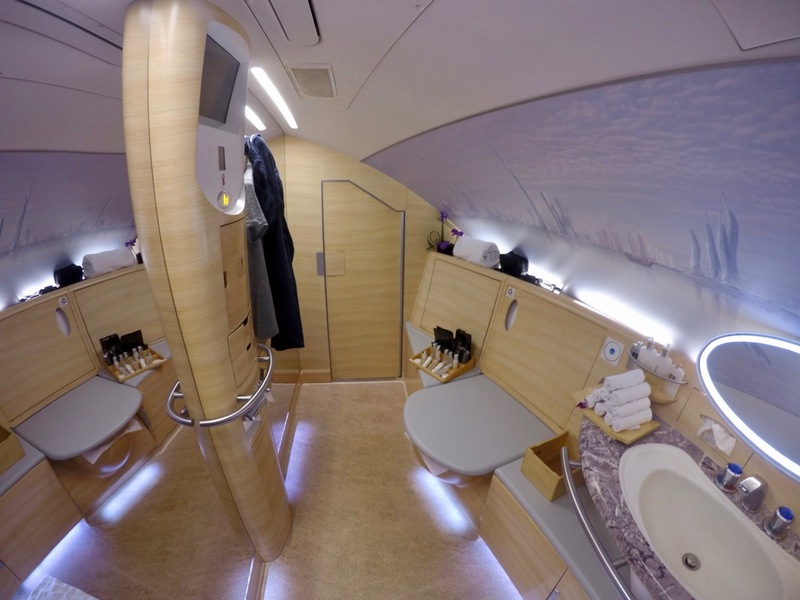 The advantages of the Airbus A380 First Class cabin are an onboard shower and bar; the advantage of the Boeing 777 is that having almost half of the First Class seats means service is generally more attentive. 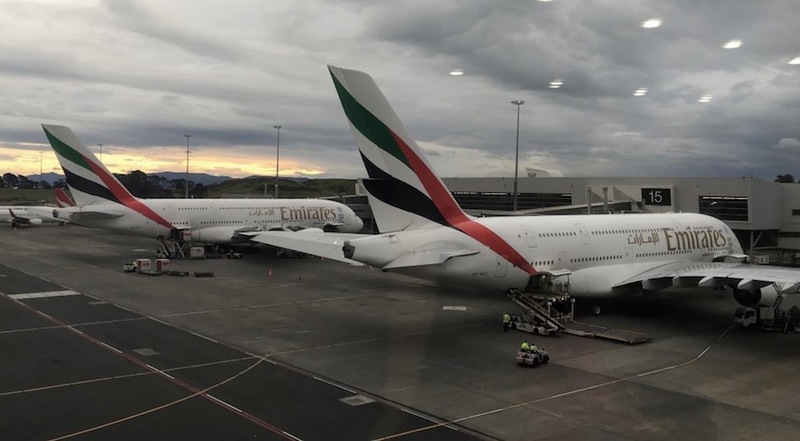 All Trans-Tasman Emirates flights depart Australia between 8am and 11am and arrive in the afternoon; on the way back, they depart New Zealand between 4:30pm and 7pm and land in Australia by 9pm, which is quite convenient. A great feature of the seat is that it has a sliding door to increase privacy. 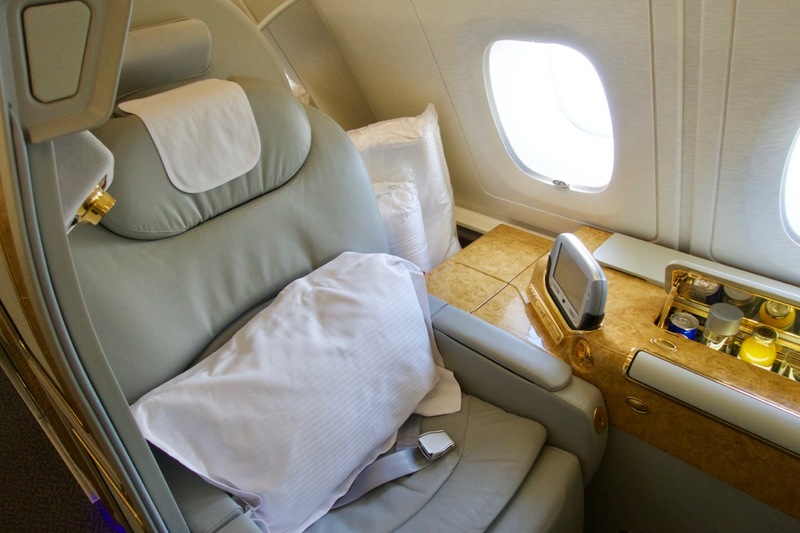 The seat is wide, comfortable, and as much room as you’ll ever need on a flight. 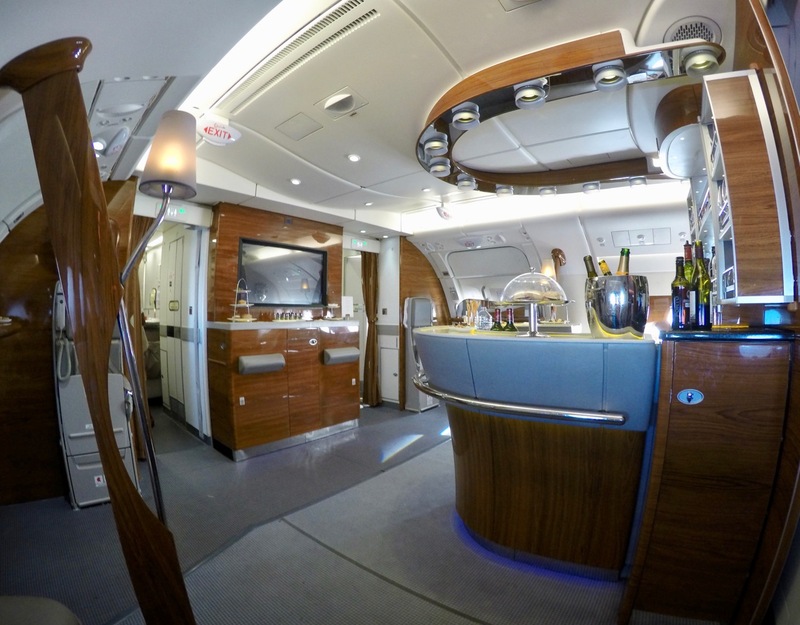 You can’t reach the TV and shelf in front of your seat without leaving right forward, and there’s a small vanity mirror and minibar to your side in case you get thirsty and can’t wait for a flight attendant. The decor is quite glitzy and over-the-top – some love it, others not so much. 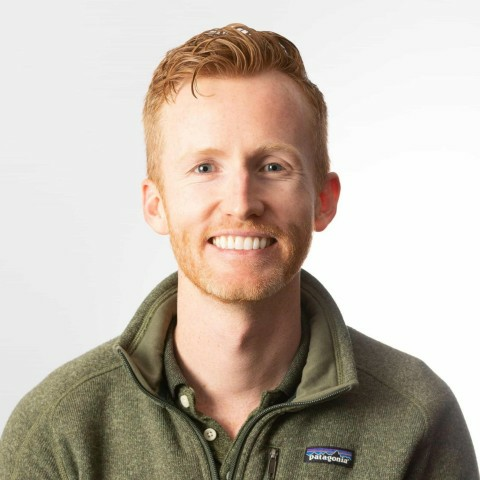 In bed mode, the bed fully reclines flat (as you’d expect) and the crew will make it up with a mattress pad, sheets, and lightweight bedding that you can crawl under. 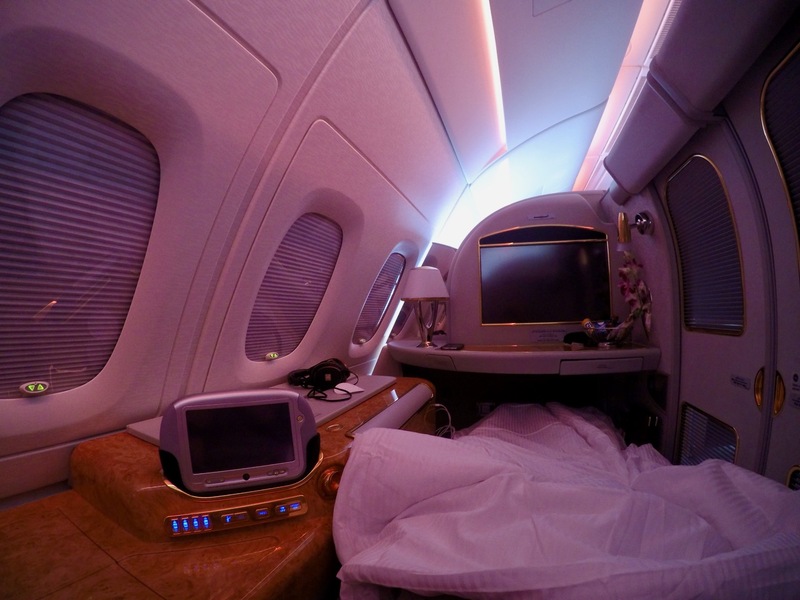 The First Class cabin on the A380 contains 14 closed (read: sliding door) First Class Suites, arranged in a 1-2-1 configuration on the Upper Deck. We’d recommend avoiding the first and last rows (1 and 4) to stay away from the noise from the galleys and bathrooms. 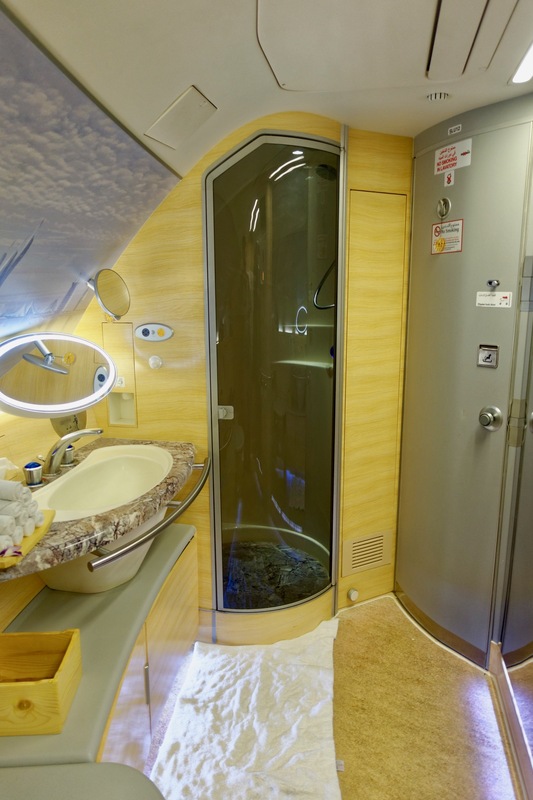 Emirates is one of only two airlines in the world currently carrying an onboard shower (the other is its United Arab Emirates competitor Etihad). 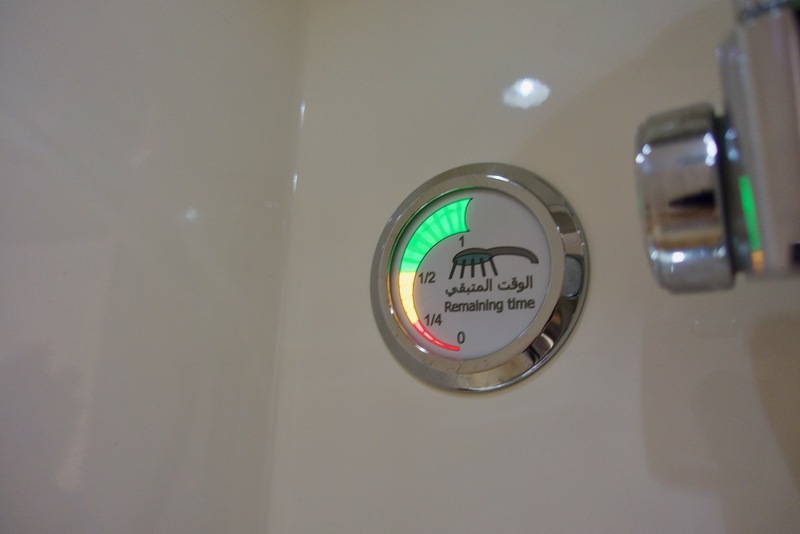 A five-minute hot shower is available to First Class passengers travelling on Emirates A380 aircraft. 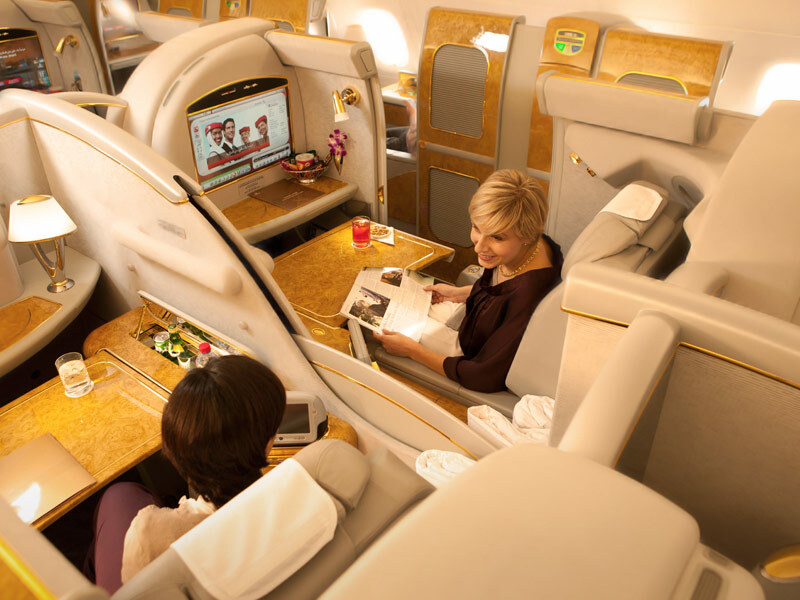 As all Trans-Tasman Emirates flights are between three and four hours in duration, it is recommended to book your shower time through the cabin crew as soon as you can. 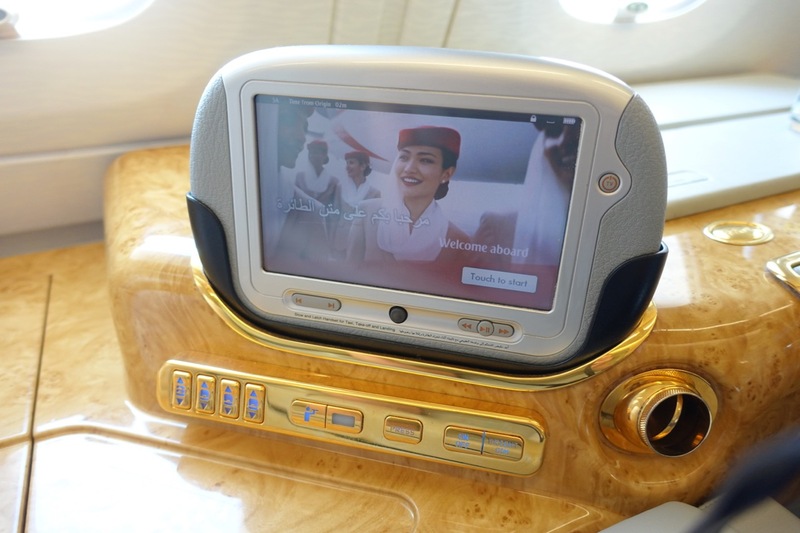 Emirates consistently has its ICE in-flight entertainment system rated as one of the top ones in the world. As the main screen is quite a distance from where you sit, the touch screen remote to the side comes in handy. 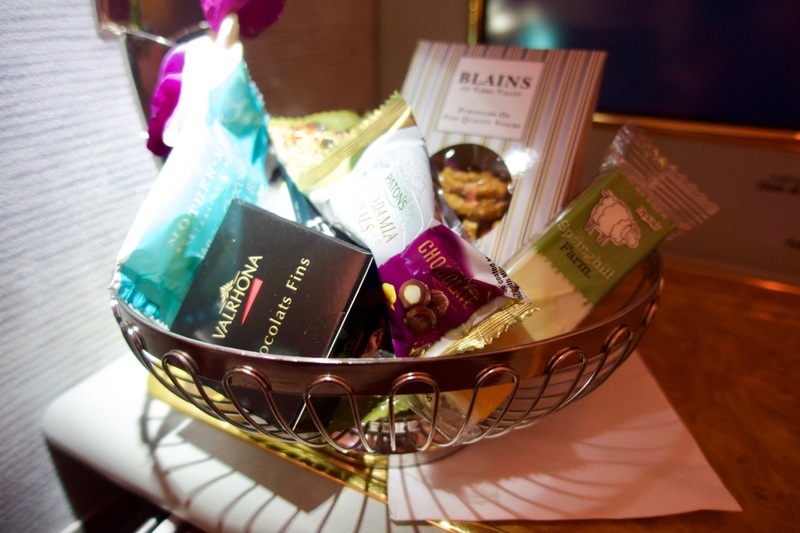 A goody basket is placed in front of you before take-off, removed, and then brought back once the crew can go about their duties. It’s tempting to pig out but you’re best to save yourself for the three course meal instead. 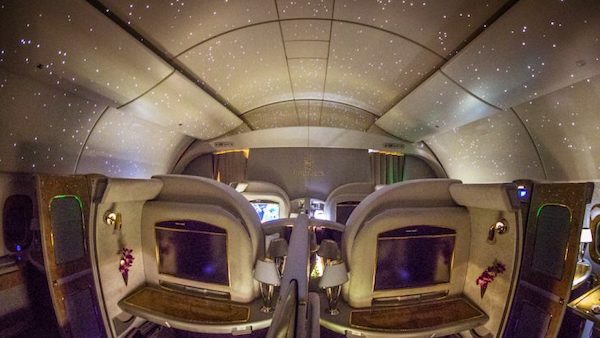 You’ll be offered drinks and snacks before take-off too. 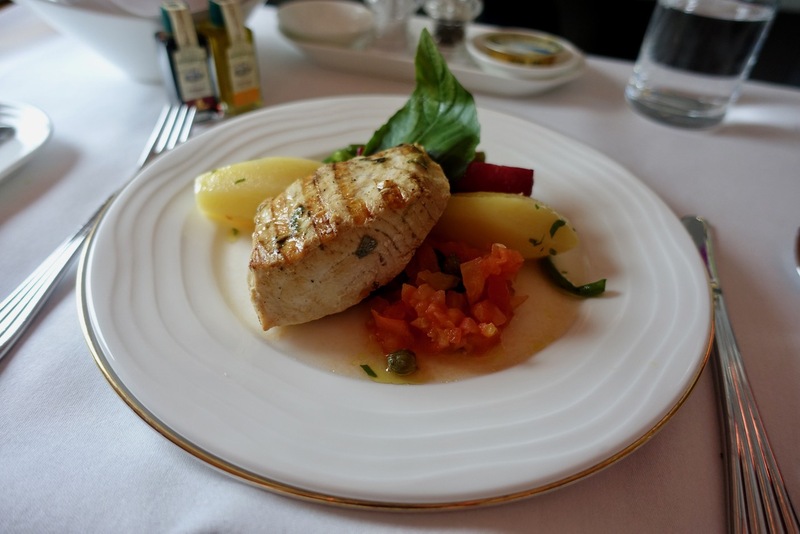 Meals are usually well presented, and come with as much warm bread on the side as you can handle. 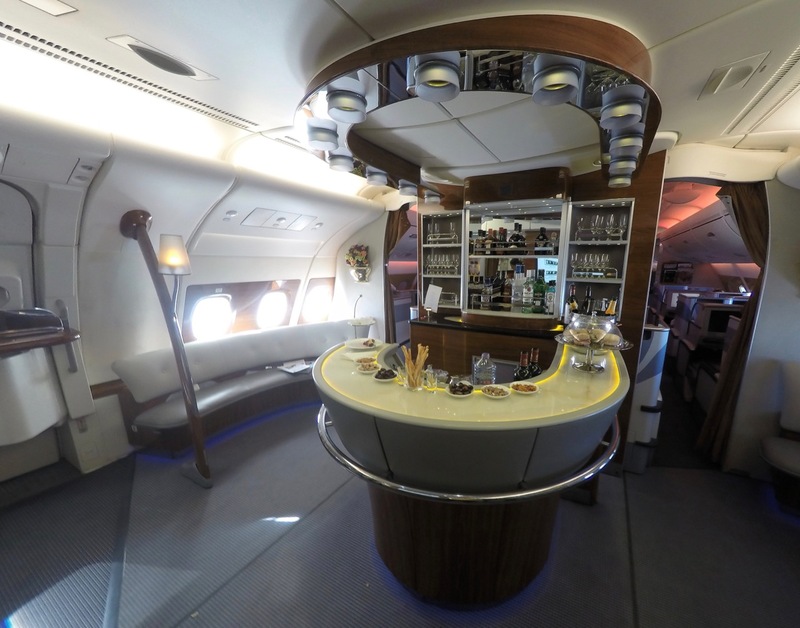 You can also access the usually well-patronised onboard bar for First and Business Class passengers at the opposite (rear) end of the Upper Deck, where there are ample standing room and side benches that seat up to four people. 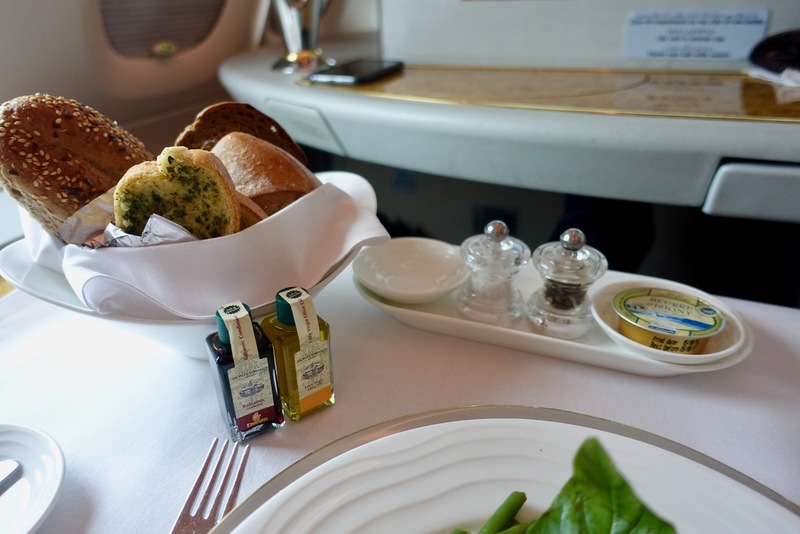 All four Trans-Tasman routes served by Emirates fall into Zone 3 in the Qantas Class Flight Reward table, with one-way First Class redemptions pricing at 54,000 Qantas Points + taxes. You’ll find that the taxes departing New Zealand are just over half of those departing Australia due to the fact that flights departing New Zealand are not subject to fuel surcharges. 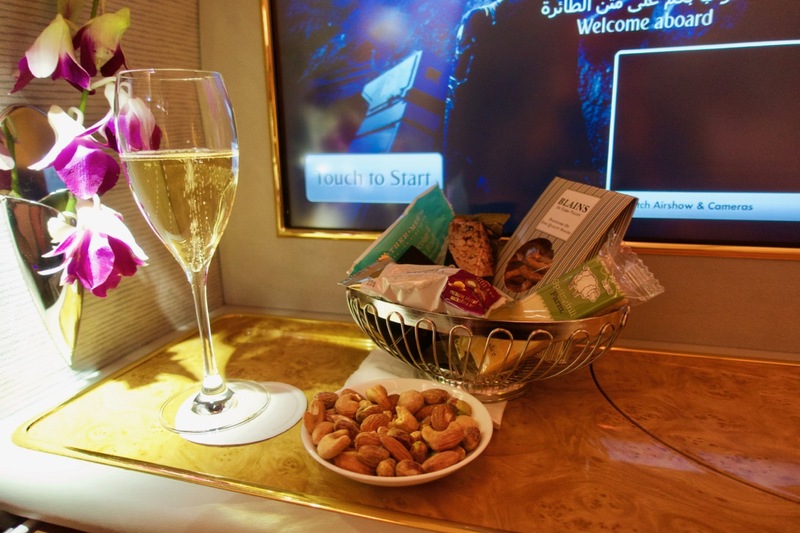 Redemption availability in First Class on these routes is generally very good and can regularly be found for last-minute trips about two weeks from departure. A one-way First Class ticket on any of these four routes from Australia to New Zealand averages $930 AUD; on the way back it’s more expensive (possibly due to the longer flight time) at $1330 NZD. If you do care about earning Status Credits with Qantas, make sure you make a booking with a QF (Qantas) flight code. 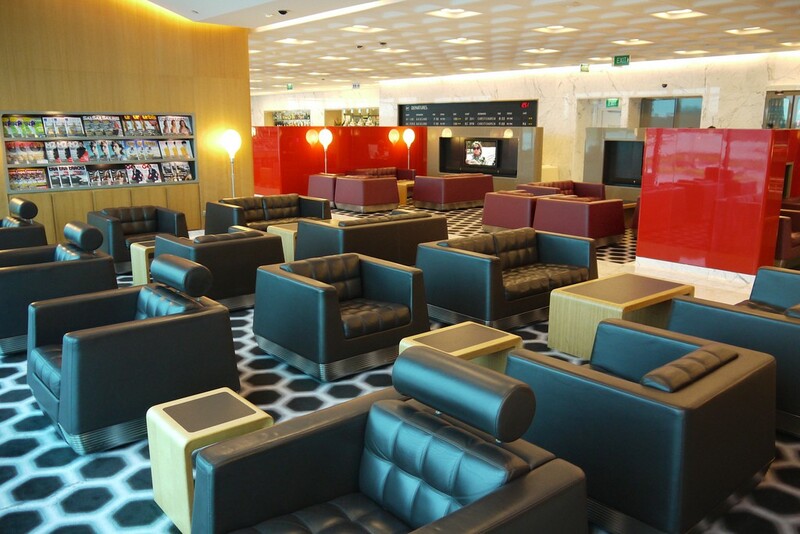 The lounges you will have access to in Australia will generally be of much higher quality than those used by Emirates passengers in New Zealand. As I wrote in a piece on news.com.au, a First Class redemption on an Emirates flight across the Tasman really is a stellar use of your Qantas Points balance. 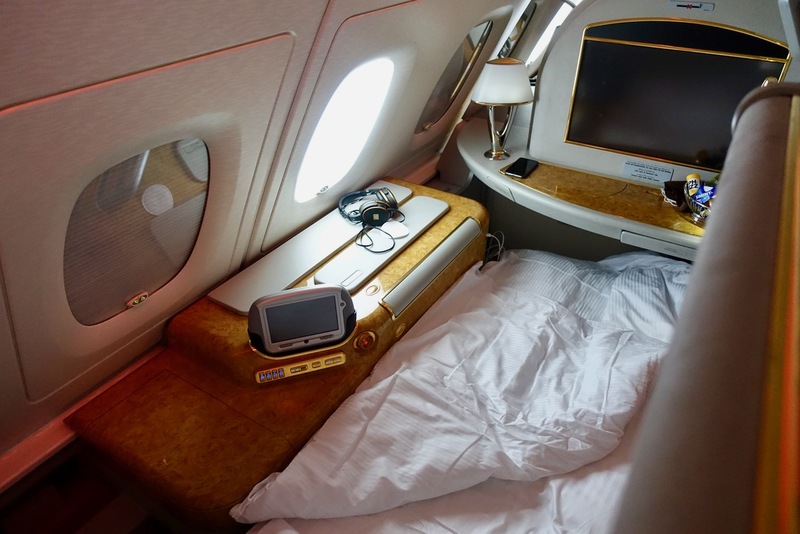 It is one of the most accessible First Class products out there and those with Qantas Points to spend are fortunate Emirates has chosen to service the Trans-Tasman market with this aircraft. To increase your chances of getting the dates you want, try to book your redemption as soon as you can, as weekends can be harder to access closer to departure. 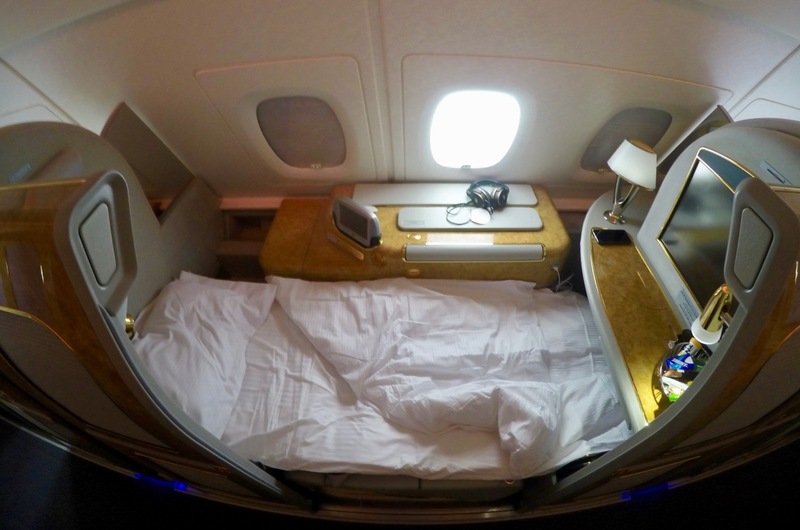 54,000 Qantas Points + less than $135 AUD in taxes = access to excellent lounges in Australia, good customer service, a high level of onboard privacy, access to a hot shower and onboard bar, and a lie-flat bed – not that you’ll really need it on the short hop across the pond. Hi just wanted to thank you for this great post. I used my points for an absolutely stellar first class flight today. Wonderful in every way. And yes they do serve Dom Perignon, I had a delicious glass today. Definitely worth every penny/point! So glad to hear that, Carolyn! Great airline product but a poor value use of qantas points. ~$1000 aud fare or 54000 add points gives a point value of 1.8cents. Much better value use of points on the market increasing the value to 3-4cents. Interested to hear if they have full service champagne ie. Dom – meaning you could down $500 of the liquid quite comfortably. how often and how cheap do these seats go for on sale? 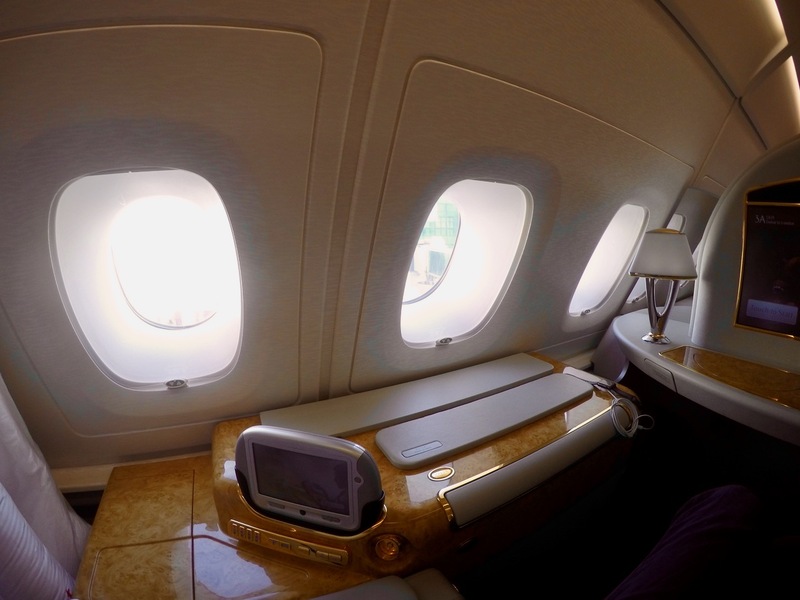 Every time I have flown first class Emirates between NZ and Australia the onboard shower has NOT been in operation. Otherwise it is a great experience!